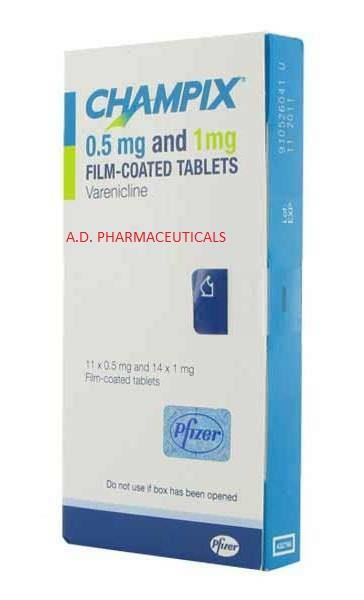 Varenicline (Brand name Chantix and Champix usually in the form of varenicline tartrate), is a prescription medication used to treat nicotine addiction. Varenicline is a nicotinic receptor partial agonist—it stimulates nicotine receptors more weakly than nicotine itself does. In this respect it is similar to cytisine and different from the nicotinic antagonist, bupropion, and nicotine replacement therapies (NRTs) like nicotine patches and nicotine gum. As a partial agonist it both reduces cravings for and decreases the pleasurable effects of cigarettes and other tobacco products. Through these mechanisms it can assist some patients to quit smoking. Champix works by reducing withdrawal symptoms, and by reducing the satisfying effects of smoking. When you puff on a cigarette, nicotine travels through your lungs, into your bloodstream and to your brain. It attaches to receptors in your brain to release a brain reward chemical called dopamine. Champix attaches to the receptors instead of the nicotine, and releases a smaller amount of dopamine. This reduces withdrawal symptoms when you stop smoking, such as cravings, poor moods, poor concentration and restlessness. However, it may not stop withdrawal symptoms completely. Champix also blocks nicotine from attaching to the receptors. So if you smoke while using varenicline, the nicotine does not have its full effect, and the cigarette may not be as enjoyable or satisfying.